Two piece boy's romper suit. 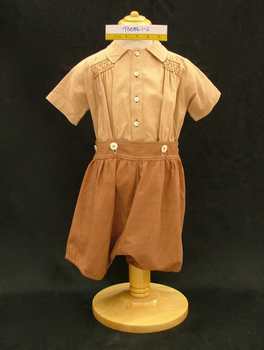 Short-sleeved beige shirt with smocking on front is buttoned to mid-brown short pants with large mother-of-pearl buttons. Cream coloured contrast top stitching. 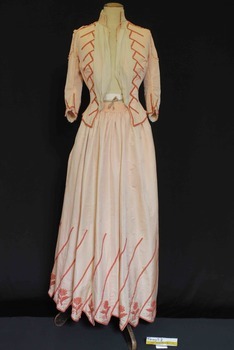 A salmon (pale orange pink) corded silk afternoon dress with orange beaded embellishments, consisting of a bodice and skirt from c.1890. The bodice features a high standing collar with triple pleated bone silk chiffon trim along the top line, under the chin. 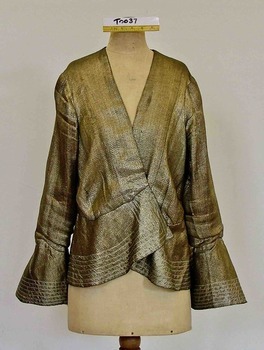 This same chiffon is also secured in two pieces gathered and secured under the collar and and at the waist adding volume over the bust line and partially obscuring the jacket closing. The chiffon is secured at the side into the main fabric of the bodice by the beaded embellishment. The pink seed beads are sewn in lines of five beads one after the other creating a diagonal design that tapers from the shoulder to the waist. The bodice is boned around the front and back and secured down the centre font by nineteen hook and eyes and additional cotton tapes. Further beading details the bottom centre front and base line of the bodice. The shoulders have been repaired with replacement fabric to match, from our records it appears that the repair work was performed in circa 1974 but no record exists of the original shoulder design and if the repair was an exact copy of the original. The repaired shoulders feature a small frill around the shoulder yoke and top of the arm. The sleeve is fitted and three quarter finishing just below the elbow. The base of the sleeve is also trimmed with the pink bead design and bone three pleat chiffon trim. The back of the bodice features shaped panels contouring the jacket neatly in at the waist and then splitting and splaying out over the fullness of the skirt. The skirt appears to have been floor or ankle length held at the waist by a wide waistband. The skirt openings have been altered from the original currently featuring two openings secured by press studs. The skirt is gathered to the waistband at front and back creating fullness. The lower part of the skirt features the same pink bead embellishment and additional beaded flowers and diagonal point edge detail. 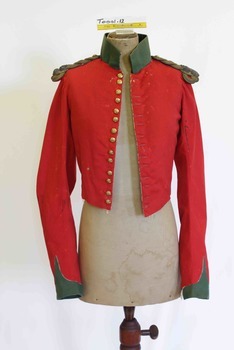 A red and green flocked cotton Military jacket believed to be British Navy from c.1807 - 1817. The jacket features a green high stand collar secured at the throat by three brass hook and eye closures. The red jacket bodice secures down the centre front with fourteen brass buttons and finishes approximately at the navel. The bottom line sits on the waistline at the sides and back, tapering lower to the naval at the centre front. 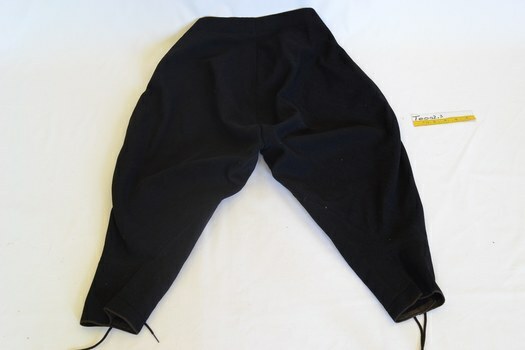 The bottom line features two substantial brass hooks one on either side of the waist to secure the jacket to the pants. The shoulder line of the jacket is a neat tight fit on the true shoulder, with a slim fitting curved sleeve with gathered fullness at the shoulder. On each shoulder is a metallic corded epaulet with North Devon XI button and second button with floral motif. At the base of the sleeve is a green cuff like detail with a curved elongated point towards the elbow. At the base of each sleeve is a further two brass regiment buttons. The cream woolen jacket lining is lightly quilted over the breast. 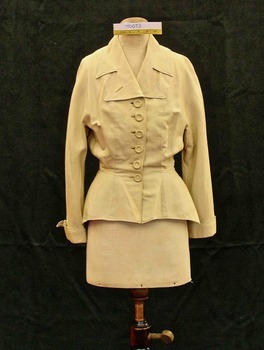 A Military jacket, possibly British Navy believed to have been worn by Captain George Ward Cole. George Ward Cole joined the British Navy in 1807, serving as a midshipman stationed in the West Indies until 1810 when he transferred to the Channel Squadron. In 1814 he was promoted to lieutenant and spent a year on the North American Coast in various amphibious operations including the destruction of Washington. After further service in the West Indies he was injured by gunfire losing hearing in his left ear and retired with honorable discharge in 1817 / 18. George Ward Cole was an early member of the Victorian Parliament and the family featured prominently in Melbourne Society in their time. They established a substantial home known as “St Ninians” at 10 Miller Street in 1841. The family reportedly entertained Melbourne’s first Royal visitor The Duke Of Edinburgh, Queen Victoria’s second son at St Ninians in 1867. In later years St Ninians was subsequently sub divided and later demolished. 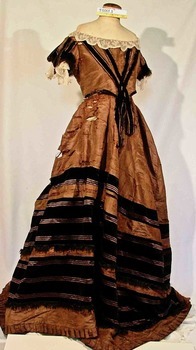 A hand sewn, brown silk, evening dress, circa 1860, consisting of a bodice and skirt. The bodice features an off the shoulder neckline edged with cream lace. A chevron design of black velvet trim, passes from the shoulders to the centre front waist, then hangs loosely to the hip line. 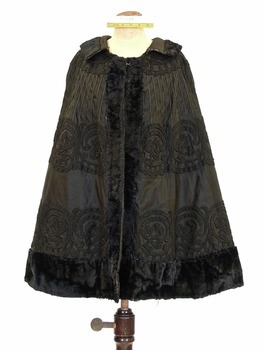 The black velvet trim on the sleeves and the skirt is edged with a black fringe. The bodice base is finished in a v-shaped front at the natural waistline. There are short puffed sleeves also feature the black velvet fringed trim and lace at the edge along with three epaulette style strips, which pass from the shoulder seam to the edge of the sleeve. Each strip finishes with a decorative bobble. 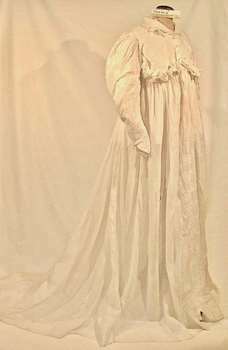 The bodice lining is cream glazed silk with steel boning, cotton tabs sewn into both sides have four eyelets for lacing. The dress has a full, floor length unlined skirt which is slightly longer at the back creating a modest train. The skirt has horizontal bands of the velvet trim and finishes with a box pleated trim of the dress fabric. 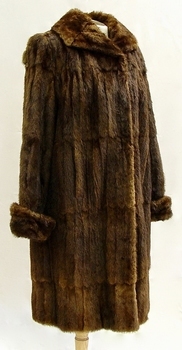 The dress is fastened at the back using two connecting rows of black velvet covered buttons. 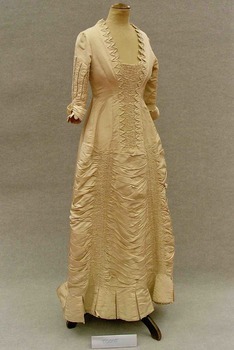 A dress belonging to the family of George Ward Cole in the late 1800s; possibly his wife Thomas Anne Ward Cole or one of his daughters, Margaret or Agnes. George Ward Cole was an early member of the Victorian Parliament and the family featured prominently in Melbourne Society in their time. They established a substantial home known as “St Ninians” at 10 Miller Street in 1841. The family reportedly entertained Melbourne’s first Royal visitor The Duke Of Edinburgh, Queen Victoria’s second son at St Ninians in 1867. In later years St Ninians was subsequently subdivided and later demolished. 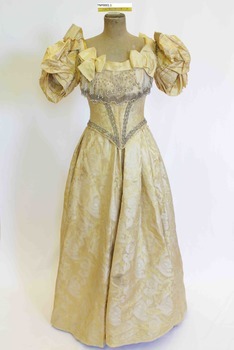 A hand sewn cream, pale blue, orange and gold embroidered satin formal dress, the bodice dates from circa 1840. 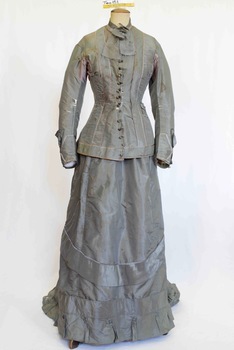 This dress shares a skirt with T0004.2, which dates from a different period. The bodice features a wide shallow neckline finished with a beige coloured cord in two decorative lines. The sleeve is set on the true shoulder and is a short fitted sleeve with decorative gathering and two lines of corded detail. The bodice is shaped to the body with 2 sets of six fine knife pleats diagonally positioned narrower over the waist and spreading out over the bust. These pleats are secured with six double lines of stitching. The bodice finishes high on the waistline at either side and points down to a point over the centre front. The base of the bodice is finished with a piped edge and beige decorative cording. The bodice encloses the body at the centre back where it has holes that presumably would have held lacing. The back features four diagonal knife pleats finishing at the centre back and splaying out over the shoulders. The waistline at the back features only a very gentle point. 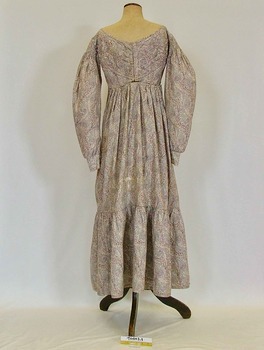 The donor and family of these gowns were long term Brighton residents, and the gowns were held by them as family heirlooms prior to donation to Brighton Historical Society. The gowns are believed to have been brought to Australia by a half brother James Smith Adams or a younger sister Sophia, of the understood original owners of these dresses, Elizabeth Emma Adams and Cecelia Elizabeth Adams, although they travelled to Australia separately. Elizabeth Emma Adams and Cecelia Elizabeth Adams were the daughters of James Smith Adams (a Squire) and Elizabeth Emma McTaggart of Tower House, Woodchester in Gloucester. A property which Elizabeth Emma later inherited. Elizabeth Emma Adams was born on 30th June 1828 at Tower House, Woodchester, Gloucester, England and died on 1st May 1909. Elizabeth created a scandal when she eloped with her first husband, Thomas Charles Gardiner at the age of 18, a marriage thats validity was later formally investigate and confirmed as valid but a second church wedding was also held. Thomas Charles Gardiner died in 1878. She subsequently remarried Rev. R.E. Blackwell but was widowed again by 1889. Cecelia Elizabeth Adams was born on 17th December 1826 and died in 1902 a spinster recluse in England. 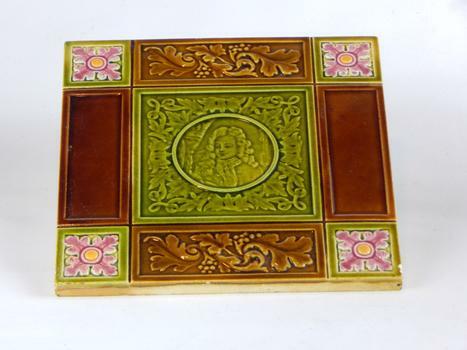 At the inquest into Cecelia's death in 1904 it was revealed that she had clearly come from a family of means as her home was filled to the brim with highly valuable goods, many in boxes. She was buried in the family vault at Woodchester. James Smith Adams was christened on 25th December 1780 at Woodchester and died 19 March 1860. His wife Elizabeth Emma McTaggart was born on 21st April 1793 in Calcutta and died on 23/12/1843. Elisabeth Emma's second son, George Henry Somerset who inherited the Adams family estate dropped the i in Gardiner and added the maiden name of his grandmother. Therefore the family name has now become Gardner McTaggart. Tower House, originally a monastery was converted into a stately home after The Reformation. Sophia Adams became a nun in England in 1851 before migrating to Australia. In 1883 Sophia went to Adelaide and founded a Dominican Priory there (Believed to be St. Dominic's Priory in North Adelaide), using her inheritance to build the Priory's Chapel. According to information originally provided by the donor, these two gowns were made for Elizabeth Emma Adams and Cecilia Elizabeth Adams, to be worn at the young Queen Victoria’s first “Drawing Room Ball” following the end of court mourning in 1838 for her uncle William IV who died in 1837. In 1838 Cecelia would have been 12 years old and Elizabeth Emma would have been 10 years old. It is possible that the dress T0004.2 was worn by one of the girls to this event. 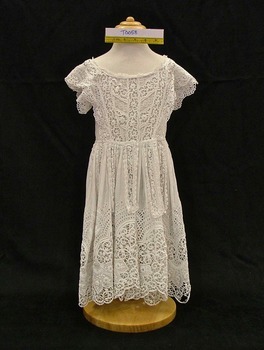 The dress is of appropriate dimensions for a child of that age although it’s design is very formal and adult. However, it is unlikely that either of the girls wore dress T0004.1 due to the size and styling of the dress. 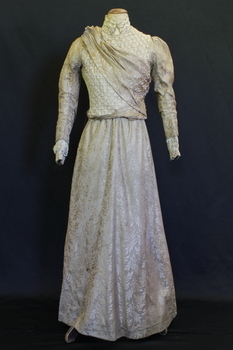 It is likely that the dress belonged to one of the girls but was worn at a later date. After the death of the girls mother their Uncle James McTaggert gave the girls much of his attention and may have taken one or both of them to such an event. These Adams family entries have been updated by information provided by Dr.Herbert Gardner McTaggart, great-grandson of George Henry Somerset in April 2016. Mr McTaggert contacted the society after finding our entries online. Some further information is held by the society. 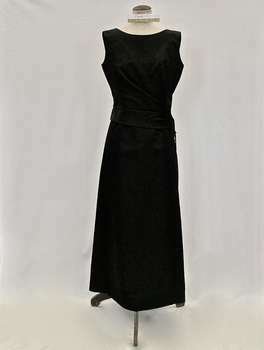 Black silk satin sleeveless full-length evening dress. The attached bodice floats over the top of the under-dress. Asymmetrical opening on bodice which features five large flat self-covered buttons. The black suede bag has chrome fittings and buttery cream coloured satin interior. 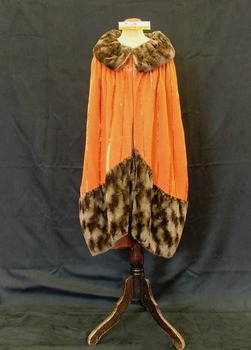 The dress was worn by Mrs Dot Paroissien in the 1950s. She remembers wearing it to a ball at the Royal Exhibition Buildings for Wesley College. The black suede bag was bought in London for her by her husband David. 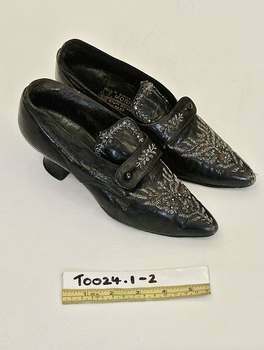 Dot wore suede shoes with a medium heel with straps across the instep and long white kid gloves. She wore a baguette chocker and drop earrings. 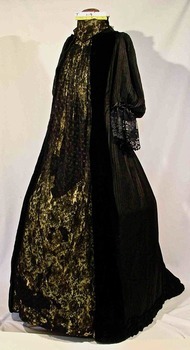 A black and yellow velvet, wool, lace and silk dress from circa 1882. The bodice features a yellow silk, black lace and black velvet collar finishing high on the neck just below the chin finished with a black lace ruffle. The collar has a flap across the front of the throat that attaches at the side with a v shaped baseline that contributes to concealing the fastenings of the bodice. The dress features a gathered central panel of black lace covered lemon silk, which falls from the neckline to the floor. At either side of this panel are matching panels of black velvet. 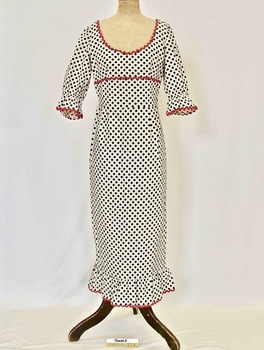 The remainder of the dress and sleeves are made of black wool featuring a self-striped and spotted pattern. The dress fastens down the centre front with concealed black buttons hidden underneath the right velvet panel. The head of the Amadis sleeve sits on the natural shoulder line and finishes tightly at the elbow. The volume of the sleeve is created by ten pleats at the head of the shoulder, sewn to the bodice and is gathered at the elbow. The sleeve is finished with a black velvet ribbon with a bow and a black lace frill. The base of the dress is finished with a ruffle of the black dress wool. The dress features a small train. The dress is boned at the back waist and features an inset panel just below the waist of gathered fabric which forms the train. 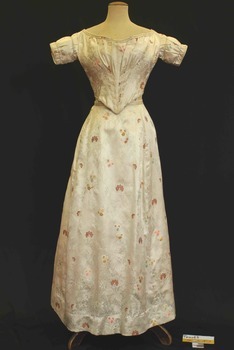 This gown, one of two similar items in the collection belonged to one of the Ward Cole sisters, Miss Margaret Morison Ward Cole or Miss Agnes Bruce Ward Cole, daughters of George Ward Cole. 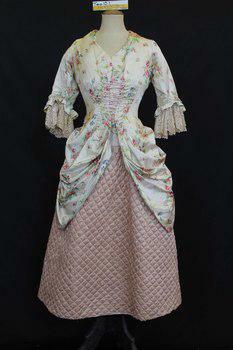 A white, mauve, purple, red, and green paisley / floral printed cotton day dress from circa 1820. The day dress features a wide scooped neckline, with a dropped shoulder line. At the head of the sleeve is has three lines of gathering creating a narrow arm hole around the shoulder, flaring out into a leg of mutton sleeve. The sleeve finishes neatly at the wrist with a cuff that secures with two brass hook and eye closures. The dress bodice is open at the centre front and secures with six hook and eye closures to the empire line waist. Over the breast on either side of the opening are six diagonal pleats, pressed and secured facing towards the neck. This pleated detail is on a facing that extends from shoulder to shoulder and finishes with a bound edge. The remainder of the front bodice is plain and secures to the skirt at the empire waistline. The skirt pleats onto a binding, wrapping around the torso and securing to the bodice with eight hook closures. At approximately knee, height the skirt has an additional gathered flounce with the dress finishing at approximately ankle length. From the back, the bodice is plain and the skirt is gathered and sewn to the bodice at Empire line. 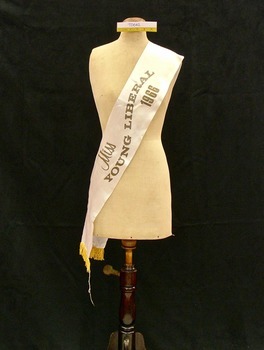 Alterations to the garment have been made with the addition of hooks and eyes. 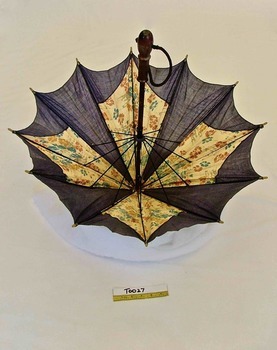 The garment is generally in good condition although the skirt at the front shows evidence of damage and subsequent repair. 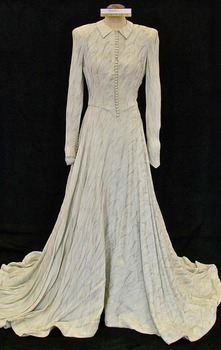 This dress has had three owners documented by letters as it was passed between Reynolds family members as a family heirloom before being donated to the Brighton Historical Society. 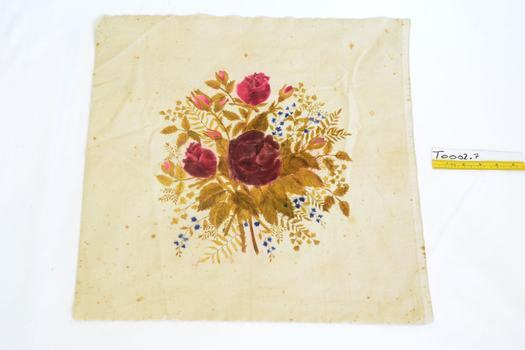 It was made in England circa 1820 according to one of these letters received with the dress from the donor. 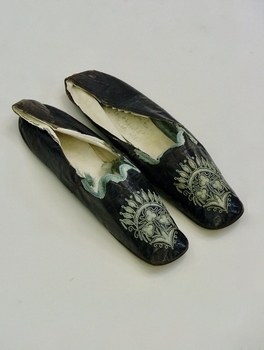 However, the dress style appears more indicative of the late 1820’s. 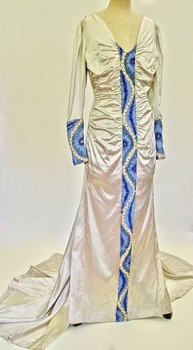 The donor of this dress donated this dress accompanied by three letters between family members as the dress was passed from generation to generation. These letters paint a picture of the significance of this dress within this family and its journey from England to Australia. In these letters there are also comments of gentle guidance as to how to dress your hair and accessorize appropriately with this dress. The letters are also held at Brighton Historical Society.